One of the biggest challenges many organizations face today stems from successful records management. Far too often companies rely on disparate vendors in various places to take care of their records—this makes it difficult to operate according to your established methods and processes. In many cases, the amount of records management vendors you have is not your companies fault as acquisitions and other mergers could have had an effect on this issue. 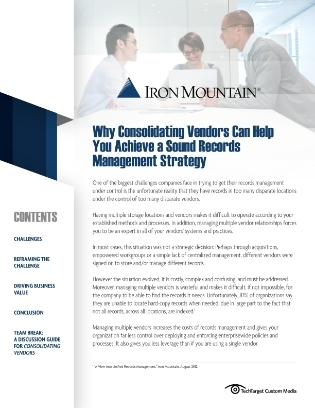 Nevertheless, the first step in achieving a sound records management strategy is consolidating your vendors. Access this white paper to gain expert insights on why and how you should consolidate your records management vendors. Discover the benefits of doing so and at the same time, uncover how this solution can help sharpen your competitive edge.